En route to adopting cannabis regulations that will likely allow storefront dispensaries and a variety of other cannabis-related businesses, the city of San Luis Obispo is seeking a consultant to help it vet applications. 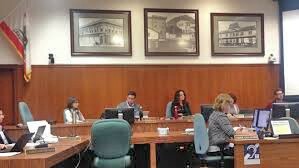 On March 20, the SLO City Council gave authorization to City Manager Derek Johnson to award a contract not exceeding $35,000 for "cannabis business regulation" and "education support" services. Johnson will issue a request for proposals and then select the "top" consultant, according to a March 20 city staff report. OUTSIDE HELP The SLO City Council is looking to join forces with a consultant to help process and vet future cannabis business applications. The consultant will assist staff in writing the guidelines for "qualifying" a hopeful cannabis business, the point system used to rank applicants against one another, and vetting the applications. That criteria will eventually go to the City Council for approval. Once the SLO City Council adopts a new cannabis ordinance and starts accepting business applications on July 1, the consultant will be tasked with vetting them as they're received. "Once an applicant is qualified and ranked, it would then be eligible to apply for a city commercial cannabis activity permit as authorized by the qualification," the staff report stated. As part of the contract, the consultant will also advise code enforcement, public safety, and the city attorney's office regarding "overall city oversight of cannabis business activities," as well as community outreach and education efforts, that include developing "materials on the topic of safe and responsible adult use of cannabis," according to the staff report. Costs for the consultant contract will be reimbursed to the city through cannabis application fees. The latest draft of SLO's cannabis ordinance allows for three storefront dispensaries, deliveries, indoor cultivation, and nonvolatile manufacturing. It prohibits cannabis events and onsite consumption, outdoor commercial cultivation, and volatile manufacturing.